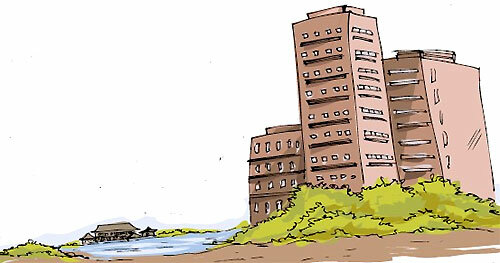 The government has decided to construct a luxury high-rise condominium at Thalapathpitiya with all modern amenities to provide housing facilities to Parliamentarians at a cost of Rs. 6 billion. The Parliamentary ComCondo will have swimming pools, gyms, restaurants and playgrounds plex would also be refurbished at a cost of Rs. 500 million, the Daily Mirror learns. A Cabinet memo submitted in this regard by Prime Minister D.M. Jayaratne was approved on January 7. Accordingly, a Technical Evaluation Committee (TEC) has been appointed to examine the construction of the condominium. A Cabinet Appointed Negotiating Committee (CANC) has also been appointed to evaluate the proposal and negotiate costs to refurbish the Parliamentary Complex, an Urban Development Authority (UDA) source said yesterday. “The Cabinet has instructed us to obtain the services of the Sumitomo Mitsui Construction Company Ltd. of Japan for the two projects, as it was this company that constructed the Parliamentary Complex in 1982,” the source said. He added that a 2.5acre site near the Sri Jayewardenepura Teaching Hospital had been identified as the location for the condominium for Parliamentarians and the project was expected to be completed before the end of 2015. “We have almost completed preliminary work on the condominium and the final decision is expected within the next couple of months. A condominium for MPs is the best option as single unit houses at the Madiwela Housing Complex will cover a huge extent of land. The UDA expects to take over the Madiwela Housing Complex of MPs once the new condominium is completed,” the source added. The new condominium for MPs will comprise all modern facilities such as swimming pools, gyms, walking paths, restaurants and playgrounds not found at Madiwela, in addition to being fully air-conditioned. The new skyscraper will be another landmark in the rapidly changing landscape of Colombo and will accommodate all MPs seeking housing facilities in Colombo in the 225-member Parliament, he said. Only 120, housing units are available at the Madiwela Housing Complex of MPs right now. Meanwhile, Parliamentary Assistant Director, Administration, Chandralal Kalansuriya said the MPs Housing Complex at Madiwela was in a dilapidated condition and repairs were being done to houses on a daily basis. An MP, occupying a house at Madiwela was charged Rs. 1,000 per month as deposits and the accumulated amount was re-paid when the MP left the house, after deducting the cost of any damages caused to the house during occupation.